Excerpts from a conversation with Jorge Blasco, "DJ of archives" at Culturas de Archivo, Barcelona. Here you will find a recent article by Jorge about the project. Using Skype messenger, we informally exchanged ideas about off- and online image archives over a period of three weeks. The conversation log has been condensed and corrected for the sake of clarity, but we made sure some Dutchisms and Spanishms remained. The Archive of Anonymous Narrated Image / Imagine you are 80 years old / Taking pictures of the gone / Tools of remembrance / Intentional or unintentional traces / In contact with images / Flea markets help to understand the way of images on the net / Dumas, Balzac and Hitler on the same page / Ghost images / The history of an archive in labels / A warranty on the labeling history / History is a way of controlling / Let's think about museums A difficult medium for conversations / Image search as a temporary collection / How do you imagine the Tracer / Same image, different label, different image. The AIAN is, mainly, a micro-history of the private management of the photographic image that uses the scene of narration and its registry as support. It is an author file which uses as departure point the construction of a data base with audio-visual registries of the moment at which different people, requested of by the project, illustrate their private photographic images -coming from their familiar albums- with an oral narration. Around this main file other data bases or sub-files are built. Sub-files are constructed to cross these registries, deepening in the relations between image, word, memory, forgetfulness, construction of the reality and relation between the great cultural stories and the narrative and construction of the intimate memory. According to several authors it is not possible to talk just about photography since the photographic practice includes a series of human performances before and after the "click" of the camera. There is one second photographic practice, that goes since it is decided if a photography is conserved or not, and that happens through all a series of behaviors essential to understand the complex verb "to photograph". To the light of these ideas 'to photograph' becomes a complex act that includes all of these practices: to reveal or not to reveal the image, to organize it next to others, to teach it, to narrate it, to trim it, to manipulate it and the practice that interest more here, the scene in which an individual uses the photography as a means, when they meet people and talk on the photography or through the photography. I have been traveling for one and a half years now through Spain interviewing elderly people, and I recorded those interviews. AIAN means "Archivo de Imagen Anonima Narrada". or: "Archive of Anonymous Narrated Image" in English. Femke Snelting: Anonymously narrated? Or anonymous images? Both. "Anonimo" points at the fact that no stories from big heroes, victims or rescuers are included. So how does one become an anonymous caretaker? When nobody else cares about your task. When you are 80 years old or even older, and you are the last generation of people who experienced images (photos) as very unique and valuable objects. When you are the last generation of people who experienced the impossibility to make pictures; just buying them and framing, hiding, cutting, showing, but never taking pictures yourself. Because to them owning and using a camera is not a normal thing? In 1936 nobody had a camera in Spain, only professionals. For me the relation to their own pictures is especially interesting. And also the photographic practise that is not taking the picture, but using it. In the AIAN project there is a very interesting group of records, those called "no photo". The people I interview, sometimes lost a photos and remember how, why and describe them. One man for example doesn't have pictures of the war front because his wife suffered from a mental illness recently, and destroyed every single picture in the house. It is especially interesting to me how the formal characteristics of the photo conditions the narration. Quite often they don't remember and create narrations based on the photo. If you watch the videos, they are great actors and actresses when they have a photo on their hands and a video camera in front of them. Are you the one filming? Yes, I am filming a lot. And editing, since scenes of narration are very important for the project; how they move, and show the pictures. How are you dealing with your own voice than in the overall project? How do you become visible? My voice doesn't appear, I am visible when I organise the material. And label it. That is my voice. And if an image evokes a story... do you find the 'before' and 'after' is invented as well? I mean... if someone does not remember what's on the picture, you said sometimes a story is made up. But does this story than usually include how the picture was taken? Invention is the basis of the project. And their narrations of how the picture was taken are great. Imagine, you are 80 yourself and someone points his camera at you and asks you to speak about all the images you lost. Where would you begin? I will not remember my "no photos", since there will be hundreds or I will have to choose. But the elderly people I interview cannot choose. That is why I work with them, it is a last chance to record that in a human scale. When I will be 80, that project would have no sense. Do you ever think about when you will be finishing this work? Well, their sons and daughters will have those pictures when they die. And they will scan them to share them (if they are several member on the family). And perhaps one of the grandsons has a weblog. "Stationed in a remote corner of Iraq, Marine Corps reservist Karl Linn's only means of communicating with the outside world was through a computer. Several times a week, the 20-year-old combat engineer would log on and send out a batch of e-mails and update a Web site with pictures of his adventures. For his parents in Midlothian, Va., the electronic updates were so precious that when he was killed last week in an enemy ambush, one of the first things they did was to contact Mailbank.com, the company that hosted their son's account. They wanted to know how to access the data and preserve it. Mailbank.com refused to give information about the account." I guess what I wanted to say with this example, is that the pictures on such weblogs might need their own form of "anonymous caretaking". Did you ever come across the habit of covering paintings? In Dutch 17th century households they used to put a curtain in front of a picture. It prevents you from getting tired of the image... So you can always see it fresh, if you need to. I knew that they do it at museums. But I did not know it as a private activity. It's very intelligent! But it could be a protestant idea as well? Catholics need images. I can't imagine catholic mediterranean households covering images. Unless... for a funeral? Or is that only about covering mirrors? Strange to cover images but to take pictures of the gone. To take images of dead babies for example, was very common, even in northern countries. I have seen big collections of dead baby pictures. You can imagine these are really hard to deal with. How did these images become a collection? That's the topic of the Archivo des Culturos-project, to make a collection. It starts with a collector who transforms the images. Images that were first lost and then reorganised as a collection, after which they become culturally valuable. And reappear! But this reappearance... in what way do you think the images were transformed as a result - I mean, isn't the significance of a "dead baby picture" depending on its place on the family altar? Well, that image was a tool of remembrance, a way of ritual, a social standard. But in the hands of the collector those images are not tools anymore. (Or they become a different tool). Their meaning depends also on the social customs or behavior as well. To collect these pictures when they are still "tools of remembrance" would be considered a mental illness. So, they can only be collected when they lost their other meaning...? Actually this meaning is not lost, but meaning that is not anymore a tool. It is not their utilitarian meaning anymore. In the 1930's, historians Jan and Annie Romein wrote 'The sources of our knowledge'. It is the last chapter of their History of the Netherlands, and I was actually surprised to find this chapter explaining how they worked. I found this a really strange distinction.... Between intentional and unintentional, and also between narrative and than not-narrative I presume. Somehow... they clearly demarcate between 'professional' history writing, and amateur... I mean, the fact that you take a picture is already somehow a decision that a moment needs to be saved for later? But this is a very solipsistic idea of history, that they have, isn't it? What about times where narrated history was not a "codified discipline"? Is the diary of Anne Frank an "unintentional" remainder? They are only considering the very moment of the writing and production. So how can all the circumstances around the appearance of it, or making it public, not be relevant? Indeed. The making public. That is a good point. All the history of the document before it arrived to the historians hands is not a key meaning of the object? Just the words of Anne Frank (if it was she who wrote)? Too purist, isn't it? Well, I think they understood that this is co- defining the meaning of these traces, but the question is whether it could be seen as part of the production of history. I think networked images might differ from 'off line' image collections... images seem to function simultaneously on different levels. Or: seem to be able to. Do you think there is a big difference? When "old" images are published you find them used in very many levels too. The experience of simultaneity is maybe just a bit more extreme online. Well, when a collector is looking for images he is in contact with images, texts organizing images are very simple. I also have this idea that the 'handling' of images is important. The shuffling, reorganising, looking close and getting an overview. The 'handling' (and this includes searching for them) is very literal and mainly text based. Flea markets help to understand the way of images on the net, don't they? The only label you find (some times) is "photos 1 euro". There are very many labels, and very complex ones. But I wonder if it wasn't the same on paper publications? It's really hard to analyze. Actually when I am trying to find a collector I use not images, I use words. Oral words, but with words I describe what kind of collection I am trying to find. And finally I go to a collector's house and he has images organized by topics with labels. Never in my archival contacts for the exhibitions! Today I have been at the flea market and I found a really good anti racist book from the 60s from Argentina. The book is great, because it has a collection of portraits of known people who had improper faces and physiognomy according to racist theories. Balzac, Hitler, Socrates etc. The book has galleries of those portraits. And also a pedagogical text about the roots of the idea of race. A nice sculpture of Socrates (from his time) is included, and he looks negroid. A Goethe portrait, Alexandre Dumas. Goethe looks actually more Asian than Germanic. But the point is, that this is first time I find Dumas, Balzac and Hitler in the same gallery! Try to find a word on Google which will make them appear together? Sometimes labels remain, and images disappear. I mean, when you search on Google very often you find the text and the thumbnail, but not the image. I have studied censorship archives a lot and do you know what? They are full of written words describing what was to be "disappeared". So, the ghost image remains...? Yes. I have studied political police archives. Those are not censoring, they are controlling "real life". And those are full of images: cuts from magazines, family albums. They made that pictures disappear and used them for other purposes. But nowadays, with "democracy" images reappear (in my books for example ;-)). What about net images? Do they disappear for ever? Police renames images continuously. I have seen hundreds of magazine pages where the image was cut and only the subtitle remains. And I have seen that same picture in police archives with a new subtitle or label. Do you have any idea what their 'grammar' is for renaming images? In case of the archives I know, I can't no say that they had a grammar. They had a task. And improvised. So you have an "Internet feeling" on these old archives. That's basically what I try to do with the Archive Cultures exhibitions. The main problem is that normally archives are hidden. only some "star" documents are published. Or when archivists try to narrate that history, they usually make pedagogical presentations. Right! Again words help -- not written representations -- but labels. Archivist (good or bad) are crazy labelers! The whole history of an archive could be narrated just with labels. Including the last one which is ours. Imagine natural history museums, or best, the Afrika Museum in Tervuren. If you loose labels you loose the history of that objects and images. Actually I think we are lucky that we need so many labels even on the Internet. The trouble is, that it is hard to make accumulative labeling visible. Anyway it's very interesting, they are discussing how to make photo archives accessible on the Internet and of course they are aware of intellectual property, so they discuss a lot about property. What constitutes an online archive to them? When could you speak of an archive? Basically they mean a digital copy of the "paper" archive. But, what's very interesting, they are trying to find a way to follow the electronic travel of images on the net, a kind of standard. So you follow the way of a photo in different archives by these "stamps". But since they are official archivists, they want warranties of authenticity of that meta data. A kind of electronic signature system based on encryption. Meaning, you can see who has made the label in a way? And does this also mean, that only 'official' archivists are able to attach a label? Or allowed? That is what they would like. So copies are signed as in traditional archives with stamps. They are the only ones who can read this meta data and transform it, like old archivist were the only ones to have the stamps. But they know they cannot avoid copies of images, so they want to have a way to certificate documents. Not only images, but all kinds of files. It seems, that if you can prevent images from being copied, you have ways of opening them up for a public again... But than you could only 'archive' images through removing them from circulation. What do you think about this, is this approach interesting to you? Well it is interesting because they have the same problems with electronic documents as with traditional documents: control, tracing a history of document. History is a way of controlling, repression archives are the best way to trace the history of images. I think technology can always be used in both ways. For example research around tracing images is mainly developed in the context of copyright control and security concerns. When a museum is closed and reformed, what happens? Images inside lose their history. They will be exhibited in a totally different way. I am interested on the life of that painting (and all paintings) at the Hermitage. Rem Koolhaas and his team are working on that. How to trace a history of the container not through descriptions or photos, but by architectonic decisions. I think one of Rem Koolhaas' / OMA's proposals for the Hermitage museum is interesting to look at. In a 3 floor building, they propose to destroy the 3 levels and build a balcony to the main wall. In this way you are able to see how the container has changed. They make you understand that the container is meaning full in a place devoted to images. I am also interested in following the history of painting collections. I mean, how powerful dynasties where actually very important influences through buying or robbing paintings and how different schools or styles are based on that. How styles would travel with the robbery? Or as a result of? Basically how what we have today is the result of the preservation that these dynasties made of what they liked or prefer. The idea that they were hiding paintings only for themselves, and later these painting collections reappeared as museums. It's impossible to really understand painting without tracing that history of disappearing and appearing. Disappearing as private marvels, and appearing as masterpieces. What point is of interest to you? You are interested in the moment they transform from private to public images? No, I am interested in how to make those traces visible. You said you are sometimes 'looking for a collector'. But are you ever 'looking for an image' as such, and how does that work? I am interested to hear about which steps you take to 'find' an image? Well, if I have a copy it's easy, but if not, again words and words. Images are a very difficult media for conversations. I started to understand searches for images in Google as 'temporary collections'. What would be your ideas about the endless potential collections... Collections which are defined by a single word? I have visited probably 10 different temporary exhibitions which title was containing the word "Picasso". Physical places are very complicated. And the process that makes possible temporary exhibitions are too. But we can very easily decode them. Even from personal relations, feelings between curator and collections, historical relations, a big world of information. Do we need all that information to be recorded? I really need to know more about how you imagine the tracer! We do not really have a clear picture of what it would be like... this is what we are actually working on. But we realise that to understand the systems these images function in, we needed think somehow inside the net, not outside. We see elements that might be necessary to look at. Or possible methods to work with. But you surely have a kind on imagination about what it would do, the kind of information it will manage. How do you see that tracer in your dreams? We imagine for example that it would be interesting to use technology to 'log' where an image has been. It must be possible to somehow trace the pages an image has been included in, where it has appeared in. Another part we are looking at, is a sort of reverse-searching. So, an image could maybe somehow be portrayed as in what other 'temporary collections' it could potentially appear. These are all quite technical approaches..
We also have been speaking to Liesbeth Levy, an interesting thinker based in Rotterdam. She writes about something she calls 'onderscheidingsvermogen' ('power of discernment'?). What she tries to develop, is methods to make 'moral judgments' based on what you, as an individual, can see. She speaks about telling apart those things that look almost the same... but are actually completely different in what they mean. like Hitler and Balzac in the same gallery? At the moment there's a lot of high tech development in scanning, tracing and detecting. Data-analysis to find out where 'criminal elements' are or to find out about copying of copyrighted files.... But what if you would use this same technology to help you think and understand how networked images actually work? ...but imagining it is a great intellectual job, isn't it?. Our devices describe and embody our thoughts, codes, and ways of thinking, so as our software does. Abraham Moles wrote a book called "the world of objects" (something like this), trying to analyze how objects are grouped in consumer societies. Very interesting, he was even using mathematics. He was trying to find some formulas (math) to represent ethical and vital aspects of how we organise commodities. He helped me a lot understanding archives actually. He describes our supermarkets, desktops, houses... As organizations with a narrative or discourse behind, actually as information containers or meaning containers. He traces the different lives of objects in consumer societies and how their meaning changes etc. etc. Actually this is a good way of analysing archives, not from archive theory but with the help of an information theorist. That is more interesting. So how does he 'trace' the lives of objects? He makes schemes and uses some mathematics formulas. He describes objects as mediators between humans, and analyses that space of mediation that is the house, the supermarket, the museum, the office, the antiques shop... so it's not only a theory of objects but he talks about object systems. I see. Does this relate to our earlier conversation on the 'handling' of files/images in an archive? It came to me when you described your tracer. I mean he made similar differences as you do between the single object and the object in different contexts. He actually analysed society as a big network of information. I miss a better English to express myself, but he didn't know about Internet when he wrote about the object world but actually he explains this "space of mediation" that is more and more a characteristic of our society, very well. Somehow, I think that the Internet is a consequence of that "space of mediation". It was already there and Internet codified it. I was thinking of the movie by Agnes Varda "Le Glaneur et la Glaneuse". It's my "pillow movie". She makes a documentary about recollecting. The film begins by interviewing a woman who collects heart shaped potatoes, and finishes with Varda's collection of images. Between that, all is possible. But the great point is that the movie starts with the painting by Manet (people collecting at country side) and in how many senses it has been used. When you try to find "glaneur" in a dictionary you always find that painting. It doesn't work for all dictionaries, only for some years' editions. From more contempory dictionaries the image has disappeared. 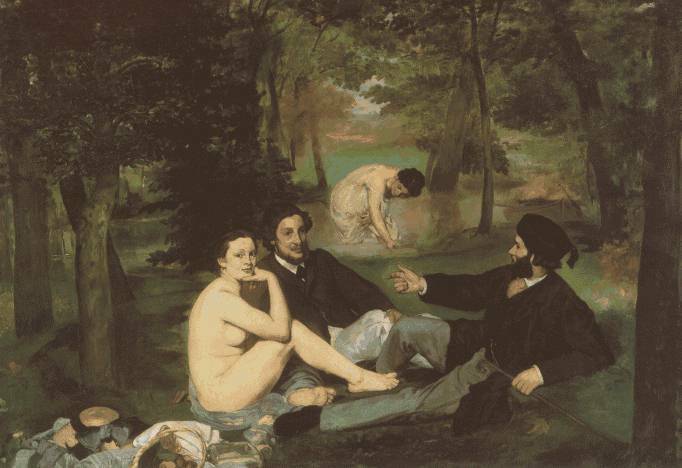 When you said Manet and 'collecting at the country side', I thought you were talking about this image. Same image, different label, different image.